Both of us went down to the allotment this morning determined to sort out the mite issue for once and for all. We fed the chickens and whilst they were distracted with food, we blocked their entrance to the shed as the chemicals in the anti-mite spray are not ideal for chickens to breathe in. My other half commenced the mammoth task of clearing out all the old bedding and removing as many parts of the nest box as possible. I took these outside and soaked them in mite spray. It turns out the roof has had a crevice that has been harbouring the mites – thus explaining why the mite numbers have been wildly fluctuating over the last couple of weeks. Basically, the number of mites found has been entirely dependent on where you put your hands when clearing out the chickens each day. I gave the offending roof a triple dowsing to ensure the mites, some of which were swollen and red from gorging on chicken blood, were exterminated. My husband then used the mite spray on every reachable surface in the nest box as well as the shed walls before using diatumous earth powder on the inside of the nest box ensuring double effective protection from mites (we hope!). Next we replaced the nest baskets and nest box roof before again powdering it all and adding in new sawdust bedding. Let’s hope the chickens appreciate all our hard work! 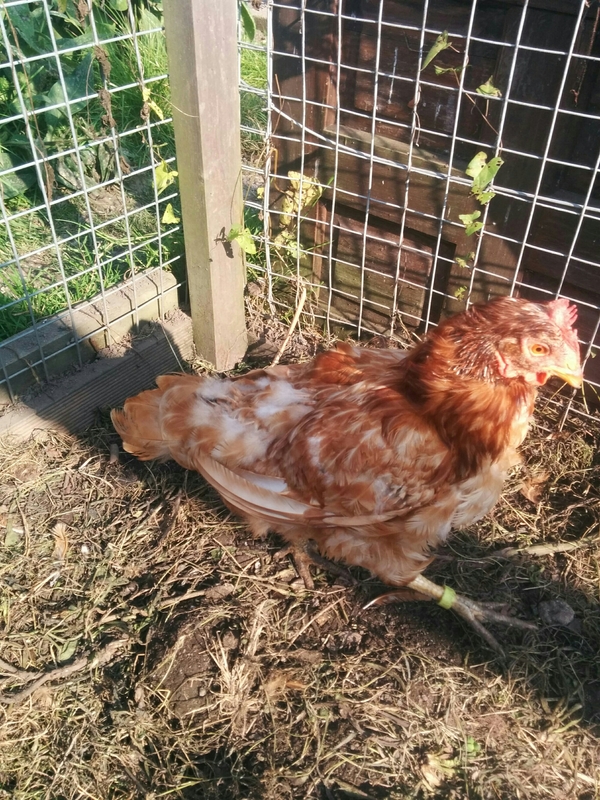 Evie continues to rebel against having feathers and is looking father bedraggled as are some of the others. Lottie still has her prolapse and is looking a little seedy unfortunately. Not entirely sure whether Cliff has had time to look at her yet. We had just finished the chicken coop clean when Dave the Plod swung by with the results of the inspection on Friday. It turns out the top plot was fine but there were a few issues with the bottom plot namely the pile of compost near the coop, the pile of wood extracted from the coop and the weeds on the half of the plot I haven’t had time or energy to clear yet. I wasn’t particularly happy about it as I am not sure they have considered how bad the plot was when we took it over and the fact that I am seven months pregnant. Ho hum. 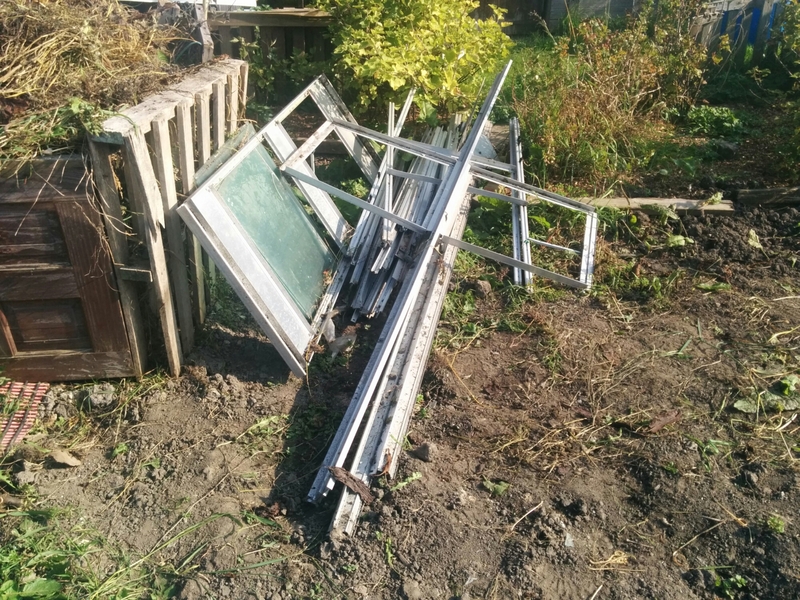 I set my husband on clearing the temporary compost pile by the coop into the main compost bin whilst I cleared the other temporary compost pile next to the raspberry bed. 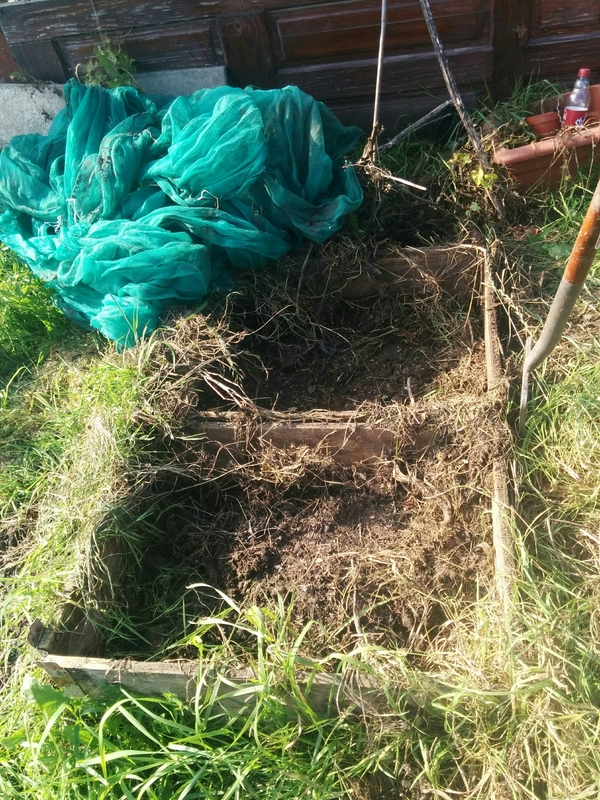 Whilst he was clearing the compost from one side of the allotment to the other, he discovered a dead rat entombed in the compost. After a short debate, we decided it must have died recently and we disposed of it. One down, several more to go I suspect. The wood taken out from the coop has been stacked neatly by the new coop extension but we need to sort through it before burning any of the rotten wood and reclaiming the good wood for other projects. The committee recommended building an A-frame for the food and water bowls in the coop to go on as this will raise them out of rat range. I rather doubt this will make much difference to a determined rat but we will give it a go. 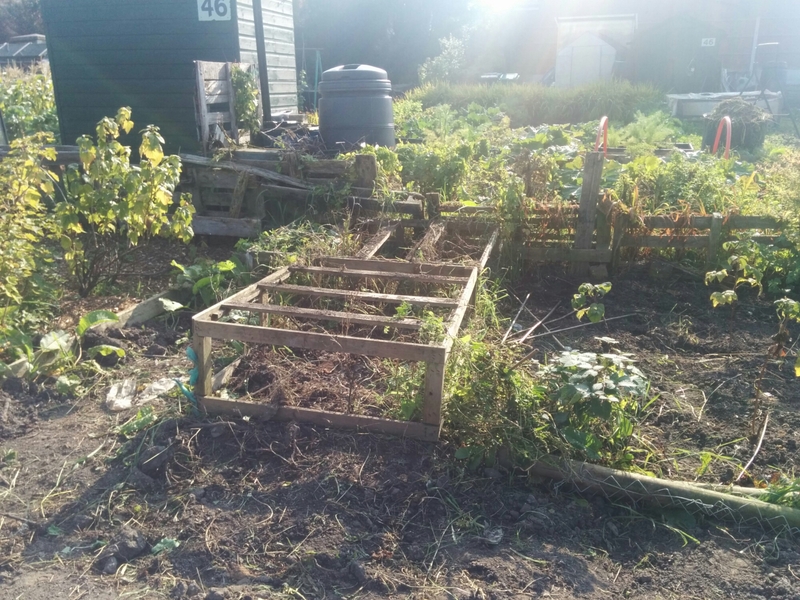 So tomorrow is going to be a busy day with boiler man coming to fix the boiler in the morning, the afternoon will have to be used go sort out weeding and tidying on the bottom plot in addition to completing the hoeing on the top plot. Busy, busy, busy! Rats are an integral part of owning chickens- one of the constant battles. The mites, once you have sorted out the hiding place should be okay. Only two months until you have the baby-time goes so quickly. How exciting. Keep well- love and prayers are with you.